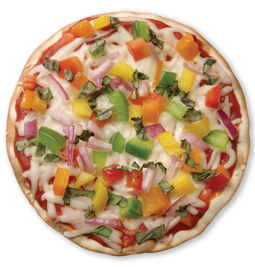 Garden Veggie Pizza - A recipe from Savor California, the online showcase for extraordinary gourmet foods and beverages from California. Spread or brush a thin layer of pizza sauce over Valley Lahvosh crackerbread. Sprinkle cheese on top of pizza sauce. Add basil, bell peppers and red onion. Bake in 275° oven for 12 minutes or until cheese is melted.